There is an abundance of beauty that can be found all around New York City. Dr. Devgan’s new 969 Park Avenue office builds on the NYC ambiance with plentiful art on display as soon as guests step through the door. Curated by Dr. Devgan, each piece has unique allure that captured her attention. The latest addition to the office was designed by Nemo Jantzen, a multi-media artist from Holland. The gorgeous piece consists of nails and thread on white wood to create texture which when looked at from a distance becomes the portrait of a woman. Another piece that is typically admired right as patients, customers, and visitors enter the office is the Andy Warhol Souper Dress. This beautiful 1966 piece is a classic icon in American art history. For those who do not know, Andy Warhol was known for his signature, and at the time revolutionary, techniques to create his artwork. He also was the designer of the Campbell's Soup can label, which is still used today. It is an incredible honor to have this piece in the office. Once patients have begun their journey to the examination rooms, a beautiful mirror greats them. This artwork was designed by Maurizio Cattelan. The mirror allows the onlooker become a piece of art without stepping into an operating room or needing a syringe. During a consultation, visitors can see Hong Sang-Sik's Breast II, which is an intriguing modern three dimensional piece that replicates the breast in an artistic manner. 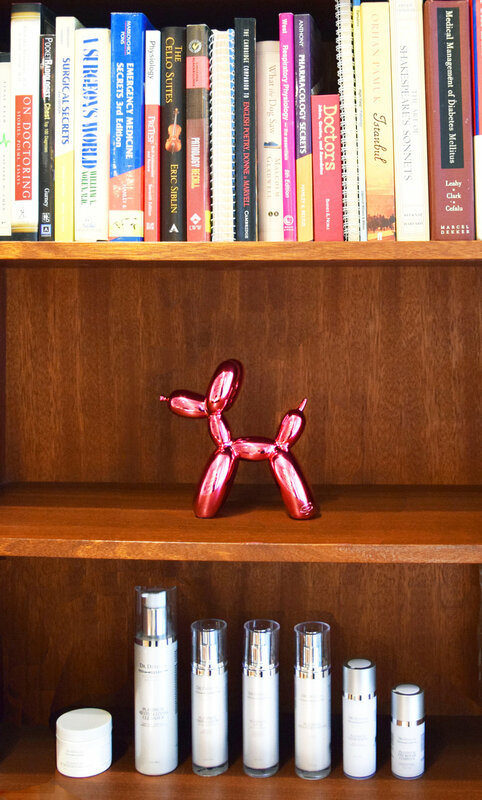 Also visible is the pink Jeff Koons Balloon Dog that sets happily on its own shelf. Just as guests are saying their goodbyes to the office, two pieces catch their eyes. The first is the hanging piece above the receptionist area. Joel Hotchkiss's Starlet is a hanging mobile made of metal mesh and aluminum to create a contemporary depiction of a woman's face. The second is a lamp; however, it is not a typical light on a nightstand. This lamp was made to have two dimensional features and still light up the room. There are still choices being made for additions to the 969 Park Avenue office collection. We hope to update you as soon as fresh artwork arrives. We hope you enjoy a glimpse into Dr. Devgan's office art choices!